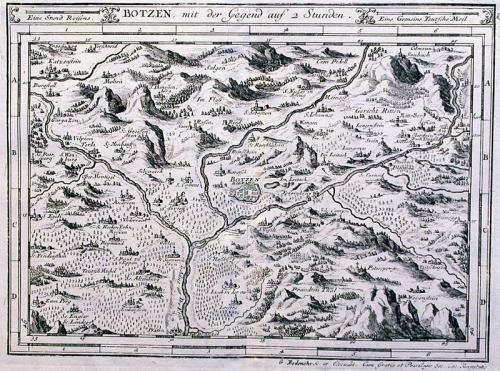 A beautiful 300 year old tourist map and guide of the countryside approx. 10 km around the town Bolzano in the Italian Tyrol. Bolzano is situated at the confluence of the Talfer with the Eisak, and a short way above the junction of the latter with the Adige or Etsch. It is built at a height of 869 ft., and is a station on the Brenner railway, being 58 km. S. of that pass and 35 km. N. of Trent. The surrounding mountains are magnificently engraved with town and castles perched on their peaks. Scarce. Fold(s) as given.